Conservative Christian radio personality and author Eric Metaxas has come to the defense of Maria Butina, an alleged Russian spy who had ties to conservative groups in the United States. Last week, Butina pled guilty to one charge of conspiracy to act as an agent for Moscow in the United States, reversing her original plea of not guilty. “It was a forced plea agreement. Totally shameful that they did this to her, threatening her with another YEAR in solitary,” tweeted Metaxas. The Christian Post reached out to Metaxas on Thursday for a response, however a spokesperson explained that because of a book project deadline, Metaxas could not return comment by press time. Last week, while in federal court, the 30-year-old Butina admitted to having worked with an American and a Russian to create unofficial communication lines to U.S. politicians and the Kremlin. This included creating ties to conservative groups like the National Rifle Association and organizing a Russian delegation to the 2017 National Prayer Breakfast, according to the plea agreement. The Russian delegation to the National Prayer Breakfast was "coming to establish a back channel of communication" between the U.S. and Russia, Butina stated, according to the plea agreement. 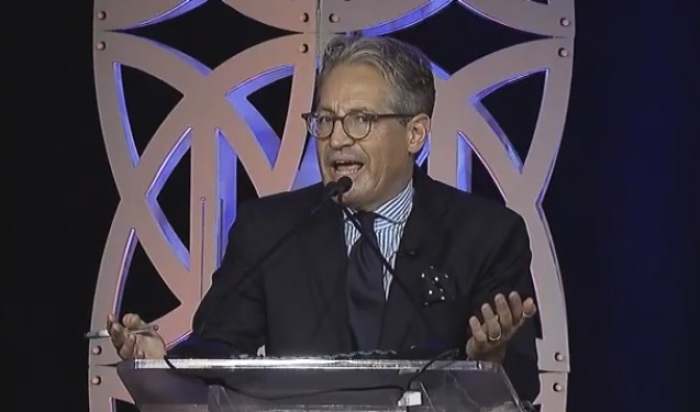 Metaxas was a speaker at the 2012 National Prayer Breakfast. As part of her plea deal, prosecutors dropped a second charge against her. Butina may serve as much as five years in prison before being deported. For their part, Russia’s Ministry of Foreign Affairs has also claimed that Butina was forced to make the plea deal due to poor treatment. “Having created unbearable conditions for her and threatening her with a long jail sentence, she was literally forced to sign up to absolutely ridiculous charges,” stated Ministry spokeswoman Maria Zakharova on Wednesday, as reported by Reuters. Butina's case was part of the larger investigation into Russian interference in the 2016 election led by special counsel Robert Mueller. President Donald Trump has criticized the investigation as a "witch hunt." The investigation has thus far tallied 36 known indictments or plea deals, according to Vox. Metaxas has been one of Trump's most high profile evangelical supporters. Metaxas' support for the alleged spy left some befuddled. In a blog post published Wednesday, Grove City College psychology Professor Warren Throckmorton stated that he believed “Metaxas has adopted the position of the Russian government over his own” and was not considering key facts presented by non-Russian government sources. “According to the Voice of America fact checking website Polygraph, Butina and her attorney said in court that she was allowed visitation and time out of her cell,” wrote Throckmorton.